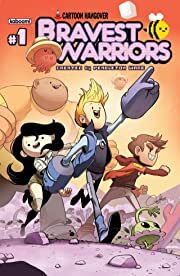 What's to Love: What do you get when you cross Star Trek's Holodeck with the wacky irreverence of the Bravest Warriors? Why, the Holo John, of course, a restroom that can make your wildest (or lamest) fantasies happen! 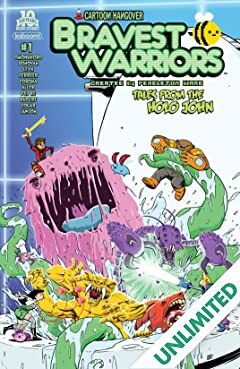 This oversized one-shot contains five short stories set in the lavish lavatory, including ones by Paul Allor (Teenage Mutant Ninja Turtles); Mad Rupert (Adventure Time: Banana Guard); and John Omohundro, the voice of Danny on the Bravest Warriors animated series!What It Is: What happens when you flush a pet fish down the Holo John? (Hint: It fantasizes it was a shark instead!) 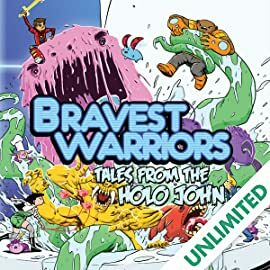 Or what if the Holo John gains sentience and "dreams of electric pee"? 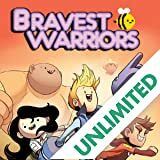 All that and more are covered in this collection of short stories about the Bravest Warriors' out-of-this-world outhouse. Who knew they used their emotions-based powers in the loo, too?